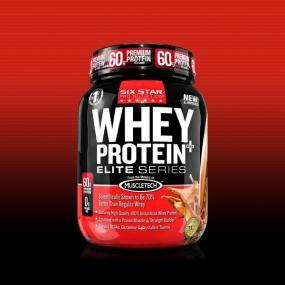 To help perform at their best, top sports pros and elite young athletes trust new Six Star Whey Protein Plus. It’s powered by easy-to-mix, 100% instantized whey protein, plus a proven muscle building compound to deliver the muscle and strength they need to win. Best of all, it features an enhanced flavor profile. In a six-week double-blind study on 36 test subjects with at least three years of weight-training experience, subjects using the core ingredients in Six Star Whey Protein Plus gained four times the lean muscle as those using a placebo (8.8 vs. 2.0 lbs.). Regular whey protein is good, but the core ingredients in Six Star Whey Protein Plus are shown to be superior to regular whey protein. In the same six-week study, subjects using the core ingredients in Six Star Whey Protein Plus gained more lean muscle than subjects using regular whey protein (8.8 vs. 5.1 lbs.) and gained two times the strength on the bench press as subjects using regular whey protein (34 vs. 14 lbs.). Six Star Whey Protein Plus is packed with 60g of high-quality protein per two scoops, and is enhanced with another core ingredient that was clinically shown to build more muscle and strength when combined with protein than whey protein alone. Loaded with micro-filtered whey proteins, fast-absorbing BCAAs, and glutamine to help you recover from your workouts, Six Star helps you build the best body ever.